Decoy | German Shorthaired Pointer in Delta. Last login over 1 year ago. 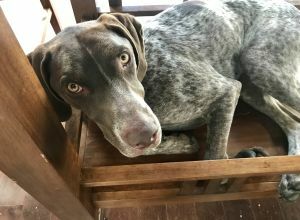 Sweet, young, playful adopted GSP. Decoy loves the outdoors. He has a lot of energy, is strong and a very fast runner. He is friendly with all people and dogs, but is generally more interested in chasing birds :p He has learned a lot since we got him in December 2016 but is still in training.